The glass furnace as such, and the technology for glass melting, seems not to interest too many people but the furnace is actually the major prerequisite for glass making. Georgius Agricola from Saxony, 1494-1555, published a series of twelve book on metals and minerals and in 1556 were these compiled into one, De Re Metallica. This book is available on the web and is a veritable gold mine for anyone interested in ancient process industry and process technology. 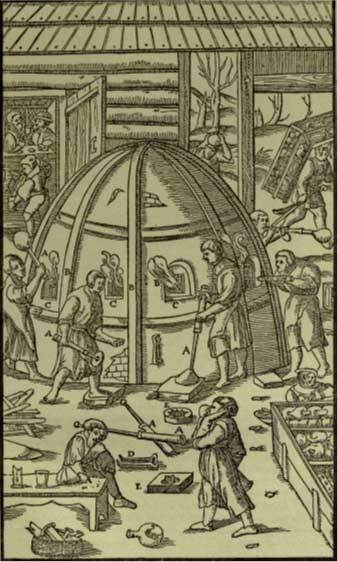 The most common understanding is that the glass furnace already from the beginning were cupola shaped with several openings. They were fired at the bottom level as shown by Agricola. To the left you can see how a glass furnace is fired through the openings "A" while pots for molten glass are accessible through openings "C". At Qualhat, an important trade centre at the mouth of the Persian Gulf between 1100 to the mid 1400's has glass been produced during a very long period, in parallel to other advanced process industry. This place has a high archaeological interest because it was suddenly evacuated in conjunction with an earthquake so many of the workshops and tools were abandoned. To the right, picture from the Ph.D. thesis Becoming vitrified by Anna Ihr, Gothenburg University 2015, you see how a cupola-shaped glass furnace in Qualhat is fired not only with drift wood and dried seaweed but also with dry fish rinsing's. In Sweden, the most common was långugnen. This had the pots placed in two parallel rows, one along each of the long-sides in the rectangular furnace chamber. The last långugn was closed as late as 1918. (Strömberg, Teknisk Tidskrift 20 april 1935). The regenerative furnace developed by Siemens-Martin, introduced in Sweden about 1850. This construction opened for improved control, radical fuel savings and also a much faster melting. Another way (from regenerators) for energy management is to use recuperators. Axel Hermansen was inspired by a French design and developed a recuperative furnace with an integrated gas generator. His construction, the Hermansen furnace, was completely dominant in Småland from 1915 through the 1950's when oil- and gas-oil firing was introduced. The third break-through was the continuous glass tank. This uses no pots at all but raw material is fed at one end of a melting basin and the molten glass is extracted continuously in the opposite end. But this type of furnace was far out of reach for the small Swedish glassworks. 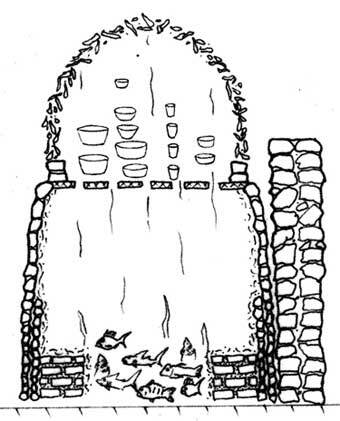 The simple ancient furnaces - like the one shown by Agricola or the one from Qualhat - were not too efficient. To obtain a quality good enough for proper glass from sand, limestone and soda ash you have to set off a complex chemistry. This requires a temperature around 12-1300 oC. Then will this very viscous glass have to be homogenised and that requires even higher temperatures, around or above 1400 oC. Then you allow the glass to cool to the more comfortable range 1100-1150 oC while working. To make one kg of glass in a day and from virgin materials would theoretically take approximately 1 kWh. If the material is re-cycled the demand is only about half. For a comparison, the furnace construction from Qualhat probably demanded some 60-70 times as much or 60-70 kWh per kg glass produced. The Swedish långugn, used until 1918, demanded about 20 times as much energy as the theoretical need. The Hermansen design, with its recuperator, reduced the energy need to about 8 times the theoretical need. Siemens' furnace, using a regenerator instead of a recuperator, was even better with an energy demand down at some 5-6 time the theoretical need. Todays' small scale glass manufacturers - like Bergdala - often use electrically heated furnaces and the electricity supply to the furnace is about three times the theoretical need. To provide the electricity, say 3 kWh per kg glass and day, you can choose either to input about 9 kWh nuclear fuel into a nuclear power station or you can use about 6 kWh of energy in the blowing wind and buy the electricity (3 kWh) from a windmill or you can use hydroelectricity from a hydroelectric power station and in that case the flowing water must provide about 3.3 kWh to the turbine so that 3 kWh of electricity is supplied to the grid. In the large scale you may find top modern glass tanks using so-called "cold-top" design. In those, the electricity input is approaching the theoretical need so that only about 1.1 kWh of electricity is needed for 1 kg of glass per day. Such furnaces are found only with the large flat-glass manufacturers or in the large-scale factories for container glass production. No such furnaces can be found in Sweden. A långugn fed with 10 m3 of wood-logs per day could thus produce about 150 to 200 kg of glass. With the Hermansenugn those same 10 m3 would suffice for about - or more than - 400 kg of glass. The Siemens regenerative furnace was more complicated but the same amount of wood would be enough for about 600 kg of glass. Already three thousand years ago we could produce glass using renewable fuels: Fish rinsing's, drift wood and other biofuels. Why, with modern techniques, computerised and automatized process control and all that, could we not do the same thing today? The question was raised in 2005 by a group of researchers at the Linnæus University and a research project was conducted. The project group retrofitted an LPG-fired pot furnace at Kosta glasswork to run on gasified wood pellets. The furnace was connected to the process control system and was then operated on gasified wood pellets for a period of time. But since the renewable fuel was heavily taxed and economically dis-advantageous for the company the furnace was again restored prior to the project end. However, the experiment showed beyond any doubts that there are now great technical problems to retrofit glass production from fossil fuels to biofuels. It is not a technical problem - it is only a question of will and ambition. 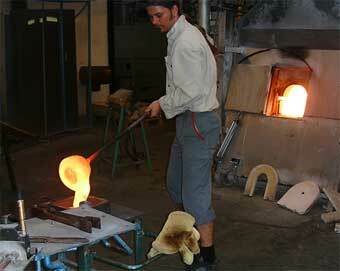 The picture shows casting of glass from the pellet-fired furnace for the glass artist Kjell Engman.